MoonMarble.com - Joshuah Justice - "Bee UV Spiral Marble"
Art Glass → Contemporary Handmade Marbles → Joshuah Justice - "Bee UV Spiral Marble"
Handmade Contemporary marble by Joshuah Justice. 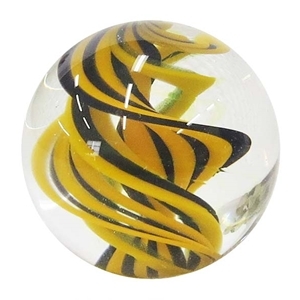 This marble has 4 wide bands in golden yellow and black spiraling down the center of a clear marble. It also contains transparent glass that is revealed under a uv light. This marble is amazing on it's own, but also incredible in a marble kaleidoscope. Approximately 1 1/4" in diameter.